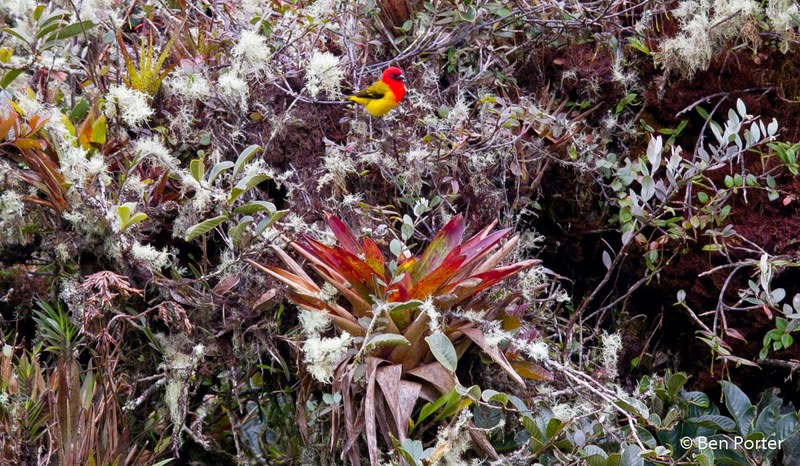 Situated an hour or so away from Quito at 3360 metres altitude, this is a spectacular 1240-hectare reserve which contains a mixture of Upper Montane Cloud Forest, Temperate and Polylepis forest vegetating the sides of steep mountainous ridges. It is a spectacular place when the foggy clouds do not totally engulf the scenery, and away from the rocky peaks and damp valleys are also some areas of Paramo grassland. 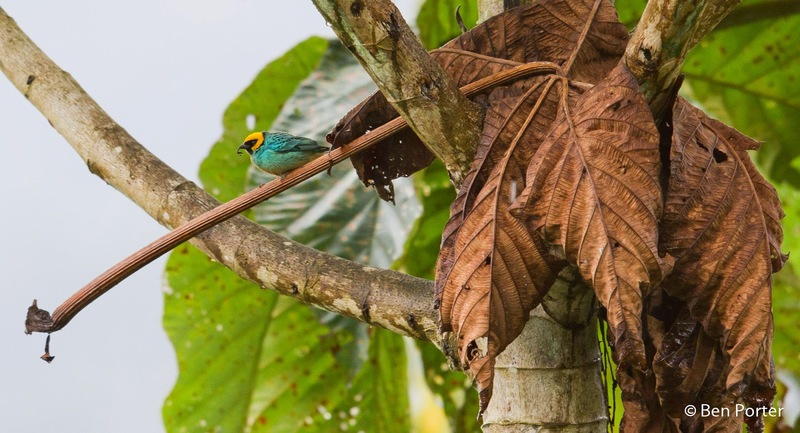 This site is one of the best places to see the very rare Black-breasted Puffleg, which is a very tricky species to see, and one which evaded me on my visit. 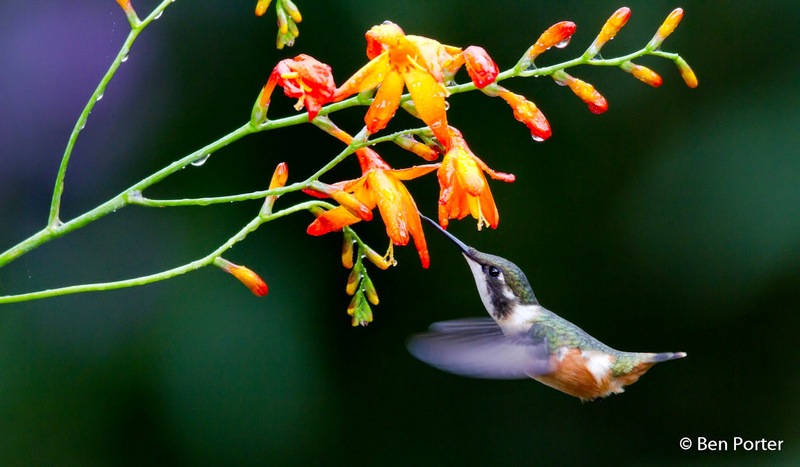 The trails and small collection of hummingbird feeders are visited by a pretty impressive variety of hummers, which include the awesome Sword-billed Hummingbird, Golden-breasted and Sapphire-vented Pufflegs, Buff-winged Starfrontlets, Great Sapphirewings, Fire-bearded Thornbill, Sparkling Violetears and Black-tailed Trainbearers. Three species of antpittas inhabit the area, and can occasionally show well (but not for me)- these include the large Undulated Antpitta, and both the Tawny and Rufous Antpittas. The steep, rocky mountainside ring out with the songs of Glossy Flowerpiercers and Rufous-collared Sparrows, whilst the dwarf trees clinging to the slopes are occasionally visited by a passing feeding flock. 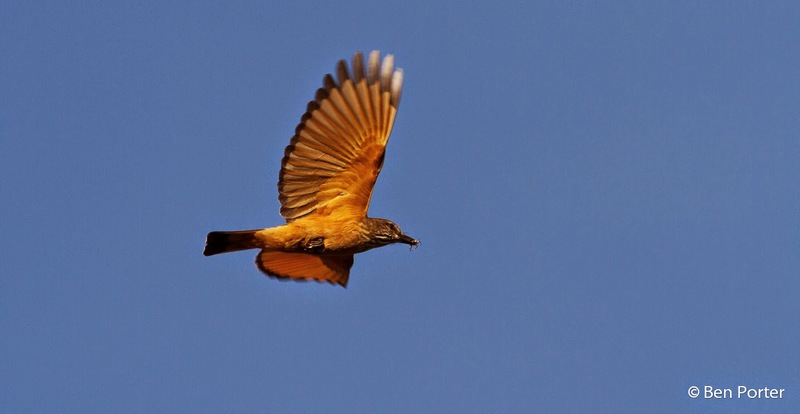 If you are lucky enough to have a large feeding flock, you are in with a good chance of seeing a cool selection of species: tyrant flycatchers like Smoky and Streak-throated Bush-tyrants, Brown-backed, Dusky and Crowned Chat-tyrants, and Rufous-rumped, White-banded and White-throated Tyrannulets; impressive mountain-tanagers such as Scarlet-bellied, Black-chested, Buff-breasted and occasionally Laciromose; and a range of other furnariids, warblers and finches including Pearled Treerunners, Spectacled Whitestarts, Superciliared Hemisphingus, Blue-backed and Cinerous Conebills. Venturing down the east slope of The Andes we encounter Guango Lodge, not too far from Papallacta Pass and about 45 minutes from the town of Baeza. At 2700 metres, the habitats here are somewhat similar to that of Yanacocha, being predominately Upper Montane Forest with a small area of Cuyuja Alder Forest. 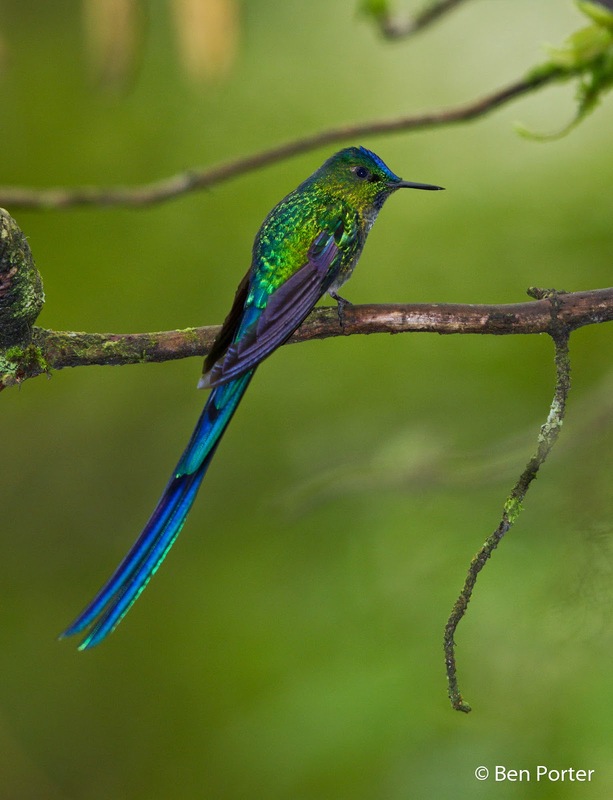 In terms of the birdlife, the varying range of habitats, from the roaring river and damp forest to the steeper slopes parallel to the road, provide a great range of species to be discovered. 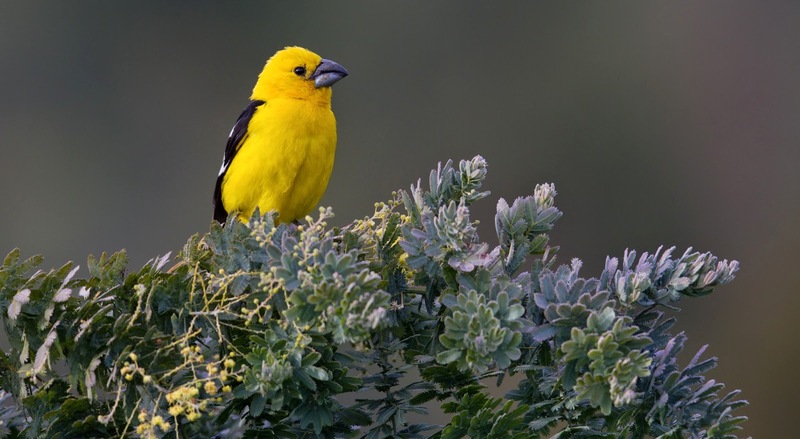 The lodge and adjacent areas of alder forest have recorded about 130 species of birds. I will outline what we saw on our half-day visit to the area, from 0630 to 1200 hours. 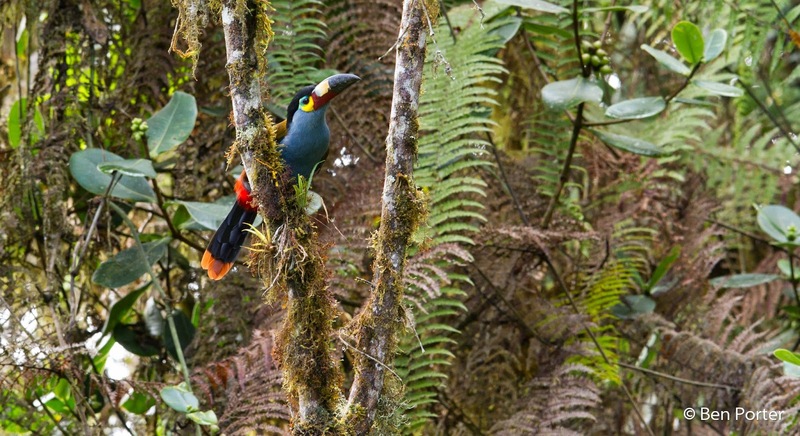 Immediately around the lodge were some cool Powerful Woodpeckers, several nesting pairs of Northern Mountain-caciques, Turquoise and Inca Jays, plus the common Spectacled Whitestarts. Down towards the river and surrounding trails, the birding was quite tough due to the ranging torrents eliminating any bird calls or sounds. 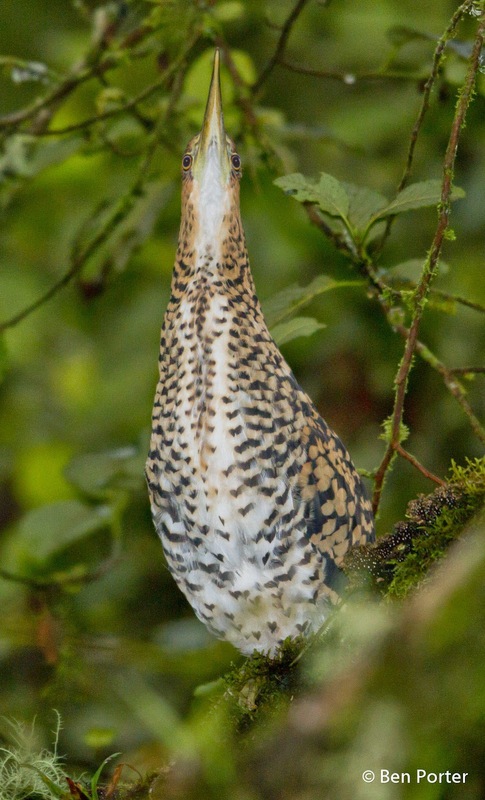 Still, we managed to discover a stunning drake Torrent Duck paddling around in the very strong rapids, and in a small wooded creek was a juvenile Fasciated Tiger-heron. White-capped Dippers could be seen along the edge of the river, but the adjacent woodland held very few passerines. Venturing onto the trails on the other, mountainous, side of the road we discovered a big feeding flock which kept us entertained for over an hour. This contained Pearled Treerunners, Montane Woodcreeper, Streaked Tuftedcheeks, Crimson-mantled Woodpecker, Sierra Elaenia, White-banded Tyrannulets, Cinnamon Flycatchers, Golden-crowned Flycatchers, Black-crested Warblers, Spectacled Whitestarts, Hooded, Scarlet-bellied and Black-chested Mountain-tanagers, Blue-and-black Tanagers, Red-hooded Tanagers, Grass-green Tanagers, Capped Conebills, Superciliared and Black-eared Hemisphingi, Grey-headed Bush-tanagers and Slaty Brush-finches. 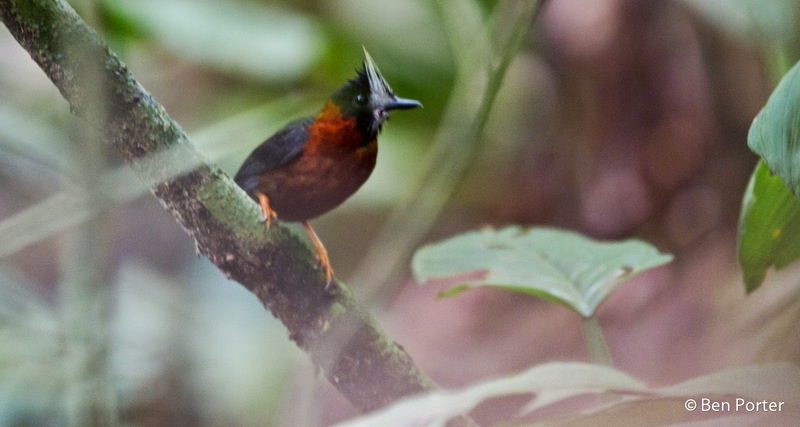 A walk along the trail to the waterfall produced four Andean Guans in the trees above, and some Slaty-backed Chat-tyrants nearby the falls. 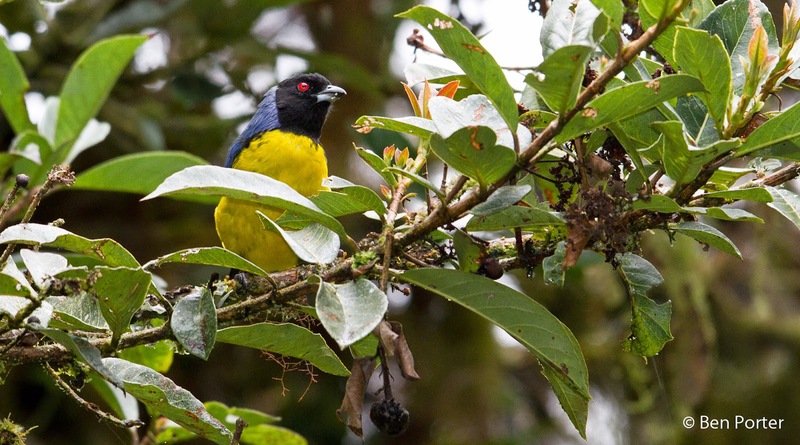 Another mixed feeding flock of fruit-eating species on the return journey produced the hoped-for Grey-breasted Mountain-toucan, plus a mixture of Northern Mountain-caciques, Hooded Mountain-tanagers and Red-hooded Tanagers. Back near the road, another small feeding flock held Rufous-breasted Flycatcher, Rufous-crowned Tody-flycatcher, Unicoloured Tapaculo, Canada Warbler, and some Grey-browed Brush-finches nearby. 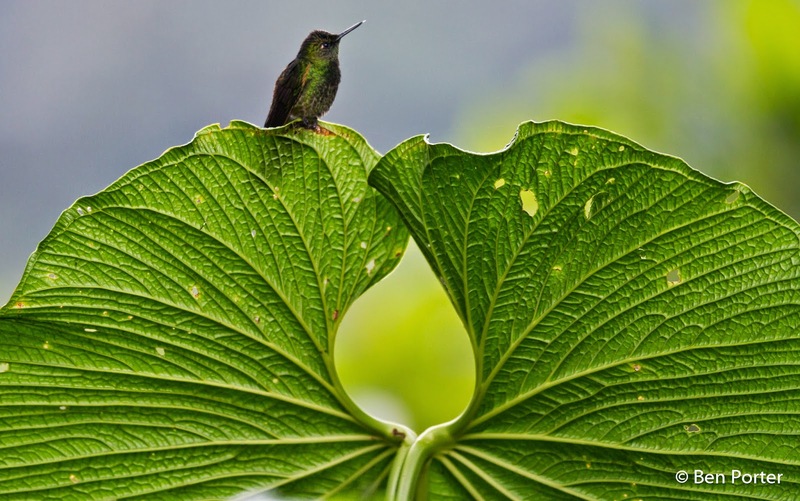 There are a good number of hummingbird feeders around the lodge, which attract a good variety of species, including Chestnut-breasted and Buff-tailed Coronets, Long-tailed Sylphs, White-bellied Woodstars, Tyrian Metaltails and Tourmaline Sunangels. Arriving at about 1500, we headed straight to the lodge to have a look at the hummingbird feeders and see if there were any birds feeding in the surrounding trees. 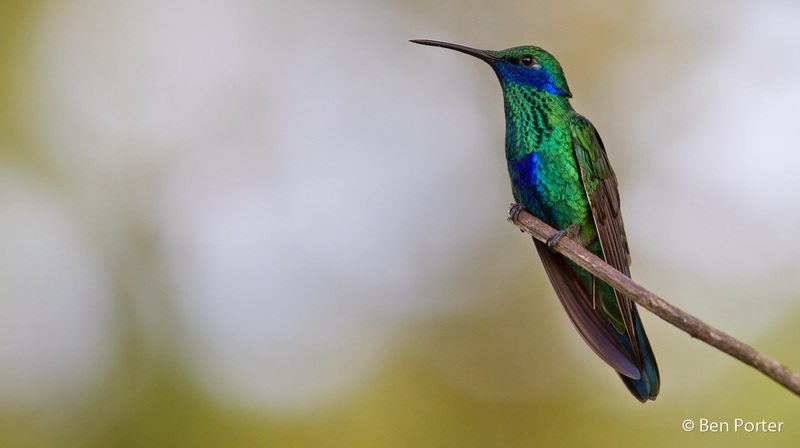 It seemed very quiet, and although Long-tailed Sylphs, Chestnut-breasted Coronets, Collared Incas, Speckled Hummingbirds and Fawn-breasted Brilliants were visiting the feeders, but the hoped-for Bronze Inca did not turn up. Just outside the lodge near the car park, we came across a fairly good-sized feeding flock in the adjacent trees. 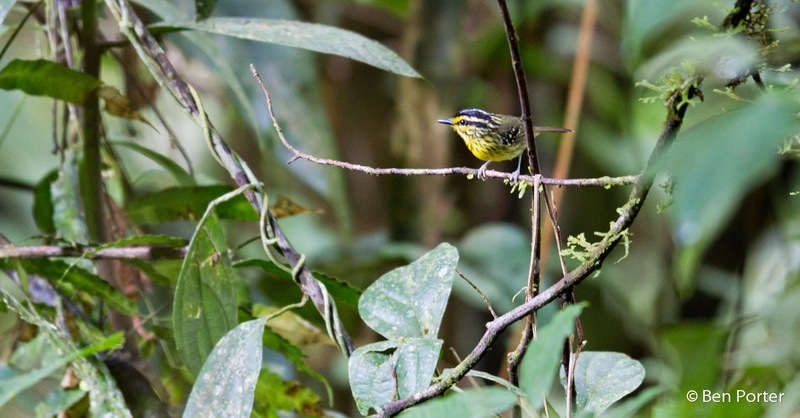 This comprised some very nice species such as Saffron-crowned Tanagers, Black-billed Peppershrike, Ashy-headed Tyrannulet, Pale-edged Flycatcher, Canada Warblers, Red-eyed Vireos, and a small selection of commoner species. 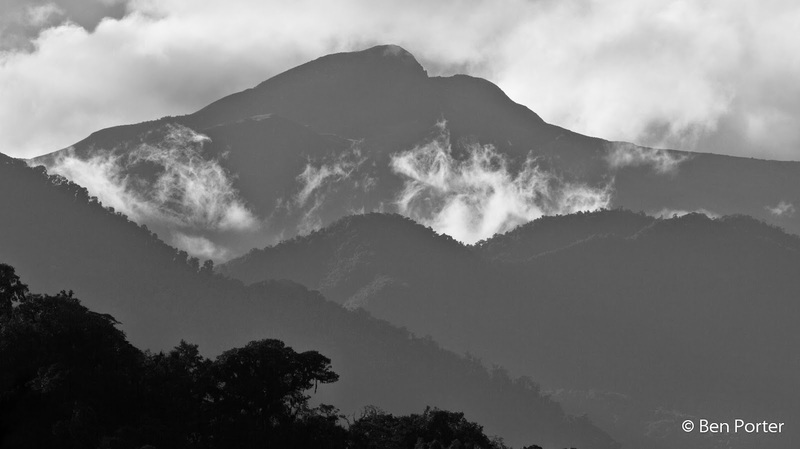 Looking out over the vast carpet of middle cloud-forest, a pair of Russet-backed Oropendulas flew past. We spent the next hour birding along the entrance road, and came across two quite good feeding flocks which jointly contained Common Bush-tanagers, Oleagienous and Black-eared Hemisphingi, Handsome Flycatcher, Rufous-breasted Flycatcher, Olive-backed Woodcreeper, Inca Jays and Rufous-crowned Tody-flycatcher. 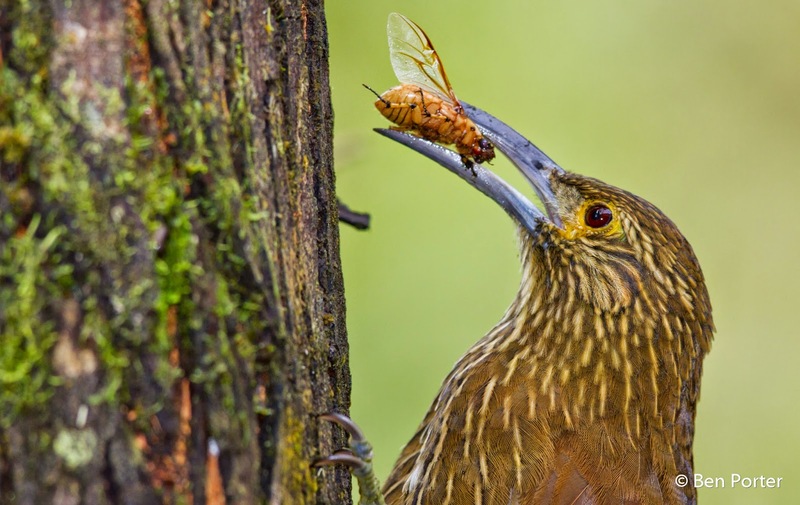 We heard both Barred Ant-thrushes and an Emerald Toucanet calling, but didn't manage to locate either. On our way to Gareno Lodge we decided to take several detours. One was to a small artificial Lagoon called Lake Paicawe, about an hour from Tena. Here you can pay a guy to paddle you around this incredibly diverse area of cecropia trees and vegetated water channels. Opposite the lake is a small lodge or cabin where you can get breakfast, and here there is also some great birding to be had. As we continued on towards Gareno, we took a side road that ended at the small village of Punibocana. We made several stops along the main road here, and had some great mixed species flocks in between rain showers. We arrived at Lake Paicawe at about 0600, when it was still dark. Our first species to be seen here was a Solitary Cacique, which are a very skulky species. When a passing shower had eased, and it was light enough, we boarded the boat and headed off along the channel. This is a very reliable site to see the Sungrebe, but unfortunately we didn't manage to catch up with this cool species. 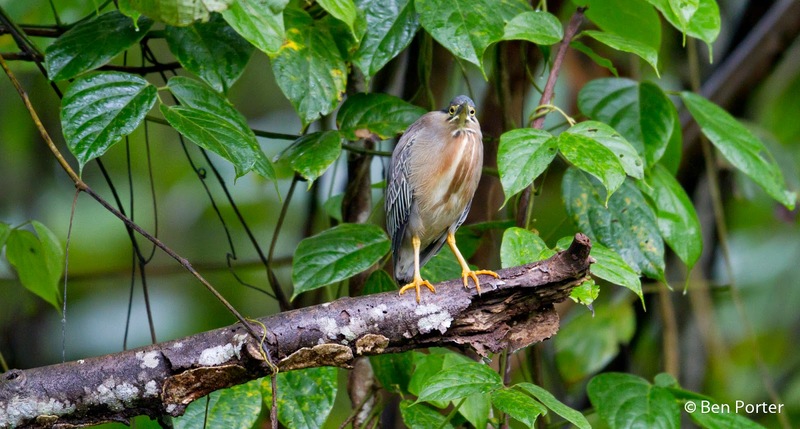 Along the water's edge were Striated Herons, Purple Gallinules, Green and Amazon Kingfisher, Greater Anis, four spectacular Hoatzin, Social and Boat-billed Flycatchers. In the trees and cecropias overhanging the channel we saw Spix's Woodcreeper, Scarlet-crowned Barbet, Black-fronted Nunbird, Little Woodpecker, Magpie Tanagers, Speckled Chacalaca, Crimson-crested and Yellow-tufted Woodpeckers, Violaceous Jays, Chestnut-eared Aracarais and Masked Tanager. Overhead we had fly-over Yellow-headed Caracaras. 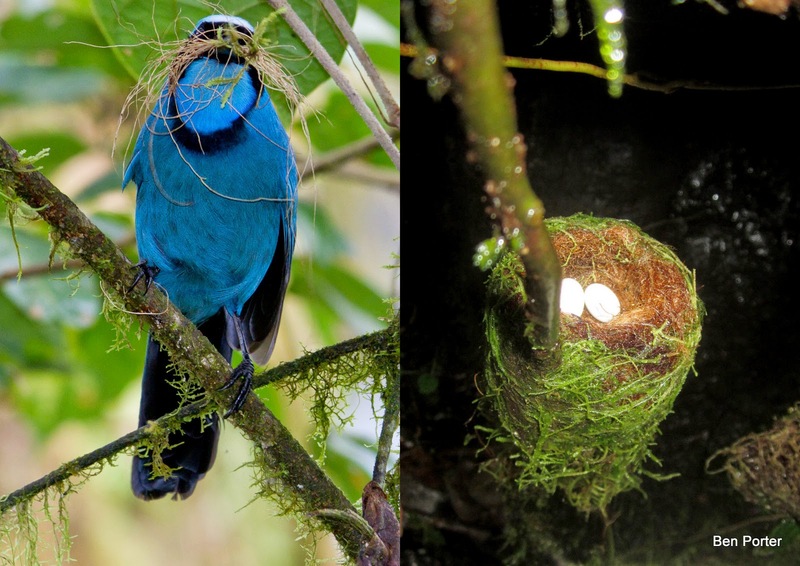 White-eyed Parrots, Neotropical Palm Swifts, Cattle Egrets, Cobalt-winged Parakeets and Blue-headed Parrots. 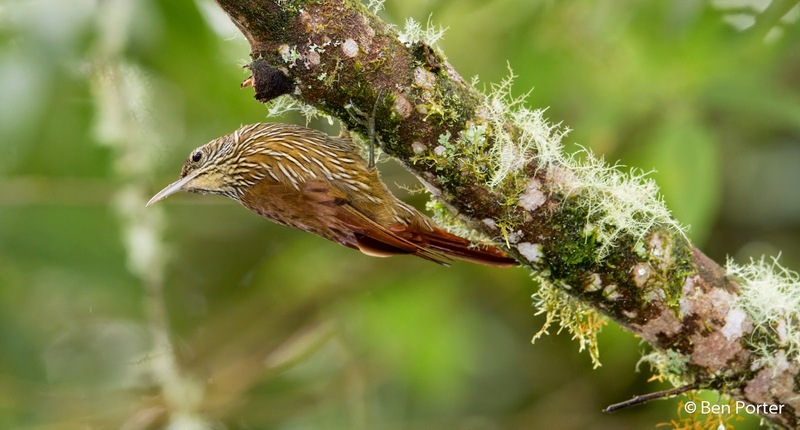 As we headed to the adjacent lodge for breakfast, we saw a Point-tailed Palmcreeper swaying about on the very top of a nearby Palm, which was a real bonus bird. 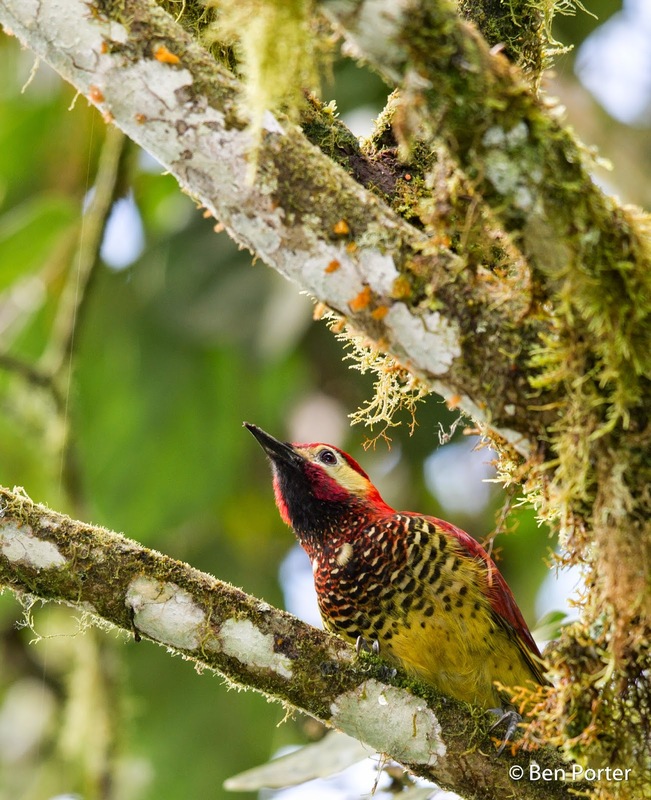 We also picked up on Black-throated Mango, Caqueta Seedeater, Black-billed Thrush, Short-crested Flycatcher, White-chinned Jacamar, Gilded Barbet, Ruddy Ground-dove, Yellow-green Vireo, Turquoise Tanager and Scarlet Tanagers around the Cabanas Rio Napo. Our journey towards Gareno was punctuated by several great stops. 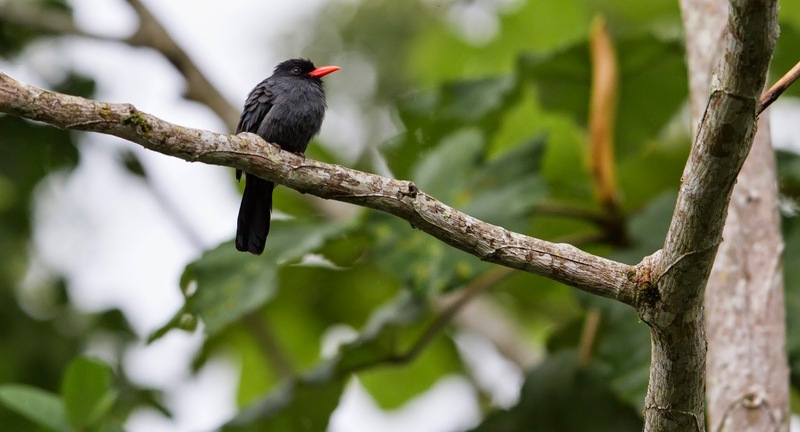 The first was along an obscure stretch of road to see a pair of Black-capped Donacobius. The nest was for a couple of feeding flocks on the road to Punibocana, which collectively contained Swallow Tanagers, Amazonian Violaceous Trogon, Yellow-bellied Dacnis, Yellow-browed Sparrow, Paradise Tanagers, Blue-capped Trogon, Moustached Antwrens, Lesser Seed-finches, Long-billed Starthroat, White-browed Purpletufts and Olivaceous Flatbill. In the clearer areas surrounding the small village of Punibocana we had both Many-banded and Lettered Aracaris, Spot-breasted Woodpeckers, Black-tailed Tityras, Crested Oropendula and Smooth-billed Anis, plus some Black Caracaras in the trees nearby. The final destination on our trip was Gareno Lodge, situated in the terra firme Amazonian rain forest. The lodge is a 1 hour 30 minute drive from Tena, along a tarmac and then dirt road. The lodge itself is actually a family-run enterprise owned by Pedro Guinda. It is located within the borders of the 712, 000 hectare Huarorani Reserve, and the lodge itself is run in conjunction with this community, to which a small proportion of the profits benefit. The Gareno Bird List stands at over 460 species, and the lodge is most famous for harbouring a pair of nesting Harpy Eagles for many years. 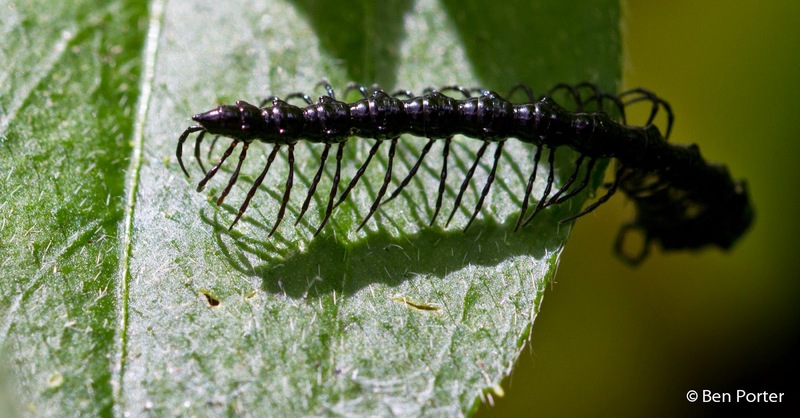 A dizzying range of species is found both along the road and within the confines of the forest and small trails. 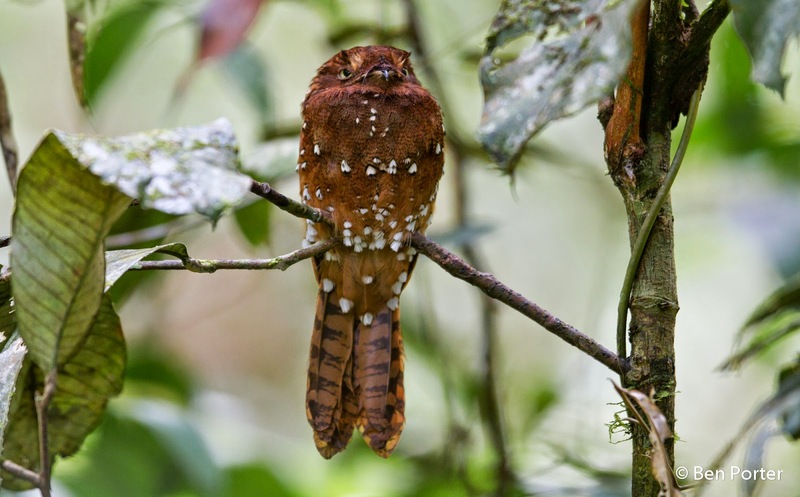 Just a few of the other lodge specialities include a roosting Rufous Potoo, Fiery Topaz, Sapphire Quail-dove, Nocturnal Currasow, Crested Owls, Thrush-like Antpitta and many, many more. Once again, a two night and two day visit was far too short to take in the dizzying variety of species that occur here. Nonetheless, we did manage to see some great birds, and recorded somewhere in the region of 200 species. We spent some of the early morning and late afternoons (when it was too dark inside the forest) birding along the road nearby, with huge 50 metre-tall trees towering over us. Locating mixed species flocks was not a problem, but at the height that they occurred, identifying anything within them was very difficult and frustrating at times. Nevertheless, we managed to identify the following amongst flocks along the road during our time there: Many-banded Aracari, White-throated Toucan, Amazonian White-tailed Trogon, Cream-coloured, Yellow-tufted and Crimson-crested Woodpeckers, Fasciated Antshrike, Lemon-throated Barbet, Spangled Cotinga, Black-tailed Tityra, Bicoloured Hawk, Coraya Wrens, Eastern Wood-pewee, Black-faced and White-bellied Dacnises, Opal-crowned, Paradise, Silver-beaked, Green-and-gold, Yellow-bellied and Bay-headed Tanagers, Green and Purple Honeycreepers and much more. 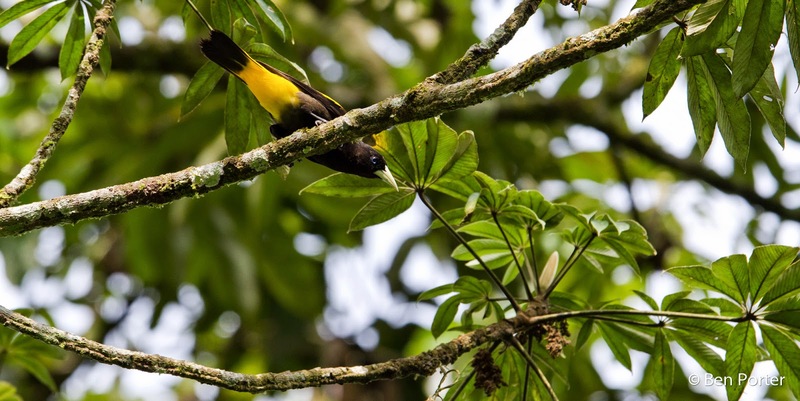 The lodge area itself is a pretty cool place for birds, with trees covered in the weaver-like Icterid nests of Yellow-rumped Caciques, Russet-backed Oropendulas and Social Flycatchers. 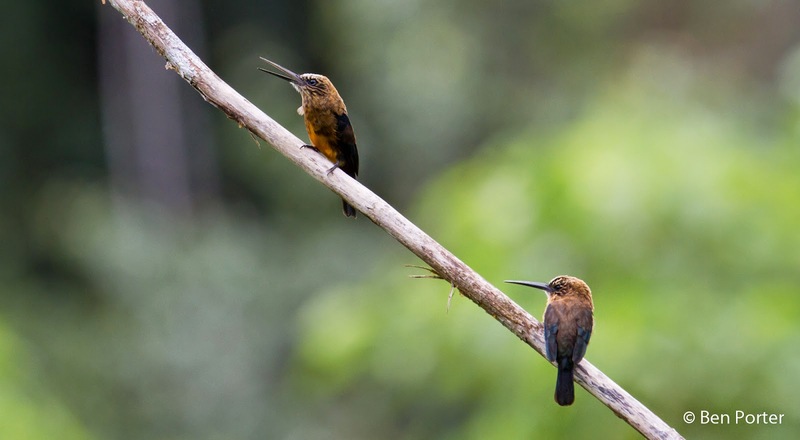 The two hummingbird feeders in front of the dining area at the lodge attracted three different species of Hermit hummingbirds (Straight-billed, Great-billed and White-bearded) within ten minutes of each other. 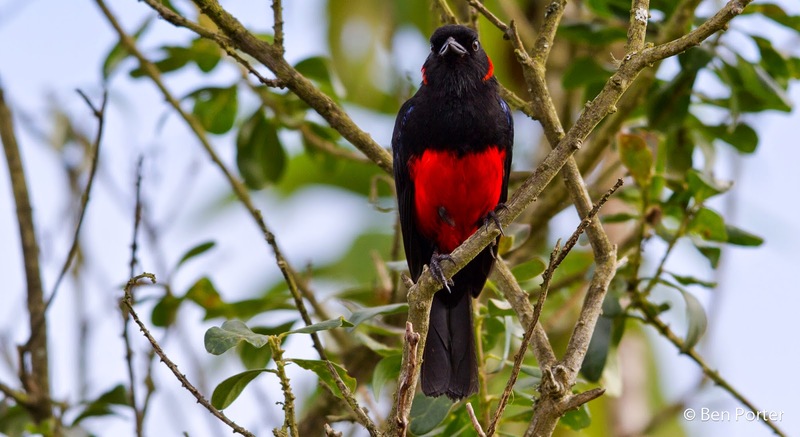 In the evening, species such as Masked Crimson Tanager and Cream-coloured Woodpeckers come in to roost near the lodge, and in the morning at 0630, a Fiery Topaz pays a visit near a specific tree and fly-catches for a little while. At night, Short-tailed Nighthawks swoop low over a clear area, and occasionally both Nocturnal Currasow and Spectacled Owl can be heard nearby. Next we venture into the small trails that wind their way through the dark understorey of the terra firme forest. Here is the refuge of antbirds and understorey mixed flocks. 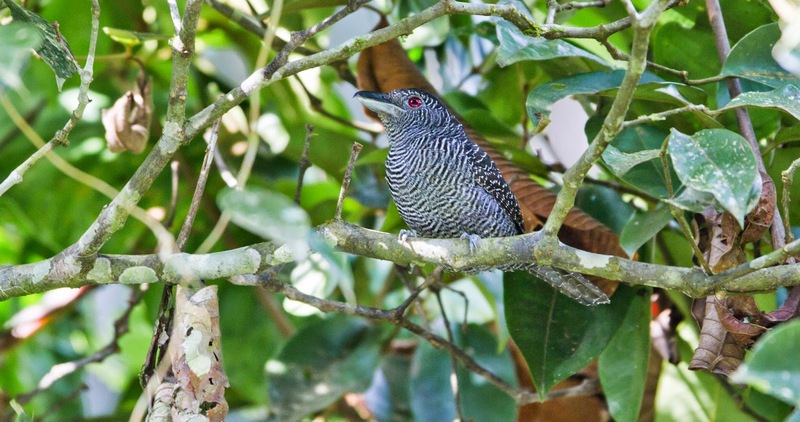 We were fortunate enough to have a sizeable ant swarm streaming past the lodge during our visit, and so a fantastic selection of skulking but stunning antbirds accompanied: Grey Antwren, White-flanked Antwren, Peruvian Warbling Antbird, Yellow-browed Antbird, Black Antbird, Spot-winged Antbird, Black-faced Antbird, Sooty Antbird, White-plumed Antbird, Bicoloured Antbird, Hairy-crested Antbird and Reddish-winged Bare-eye all put in fleeting appearances. We also encountered one or two mixed species flocks on these forest trails, although trying to identify the species within them was extremely difficult. 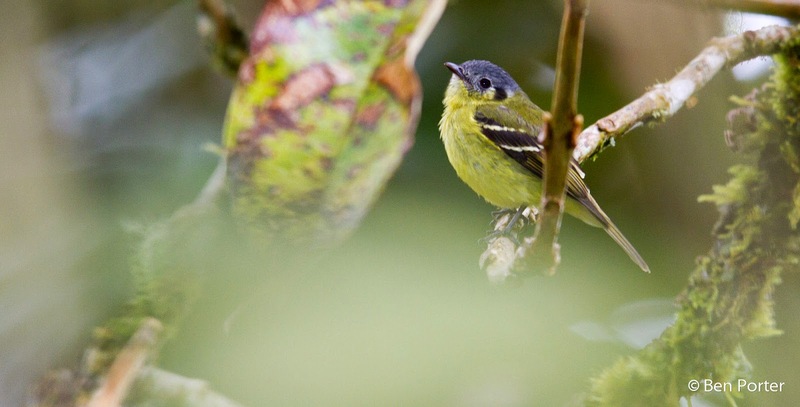 We recorded Dusky-throated Antshrikes, Screaming Piha, Lafresnaye's Piculet, Grey and White-flanked Antwrens, Ocellated Woodcreeper, Cinnamon-rumped Foliage-gleaner, Flame-crested Tanagers, Green Honeycreepers, Cinnamon Neopipo, Dugand's Antwren, Black-banded Woodcreeper and Cinnamon Attila in one flock. 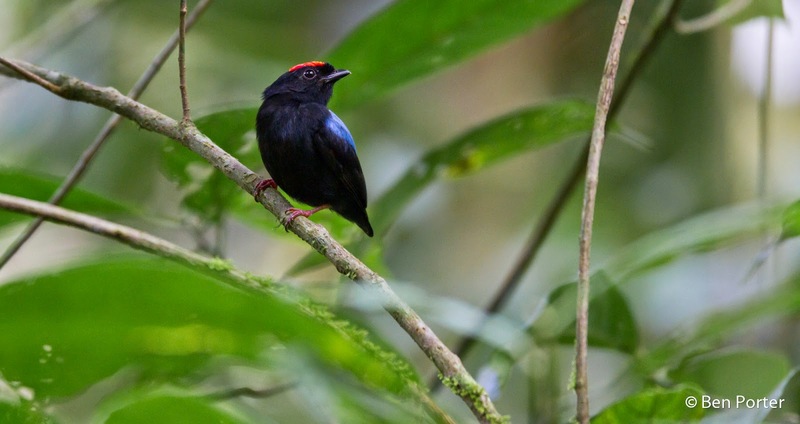 Other worthy mentions of Gareno must go to the regular leks of White-bearded, Blue-crowned and Blue-backed Manakins; a Casqued Oropendula that turned up around the lodge; a Spix's Guan on our last morning, and both Red-necked Woodpeckers and Black-bellied Cuckoos. Well, I have now been in Ecuador for just over six weeks, and have just over two weeks left in the country. For the most part I have been guiding small groups of people around the trails and roads near Bellavista, and occasionally a little further afield. I have just returned from a fantastic six-day birding trip down to the Amazon region not far from Tena, taking in some sites such as Guango and San Isidro on the way down the east slope of the Andes. For now a write-up on the trip will have to wait, as it will require more time and internet than is currently available to me! To keep a bit of content going on the blog, I will show a few images of the wildlife and landscapes around Bellavista, and try and produce some interesting info. It is now invierno in this area of Ecuador, which is basically the rainy season. At Bellavista, light rain has been setting in at about 1200 every day, and lasting until about midnight, but occasionally there have been periods of constant rain for several days! When the mist clears away, the landscapes are pretty stunning, which volcanic peaks such as Pichincha and Cotocachi sticking high above all others. 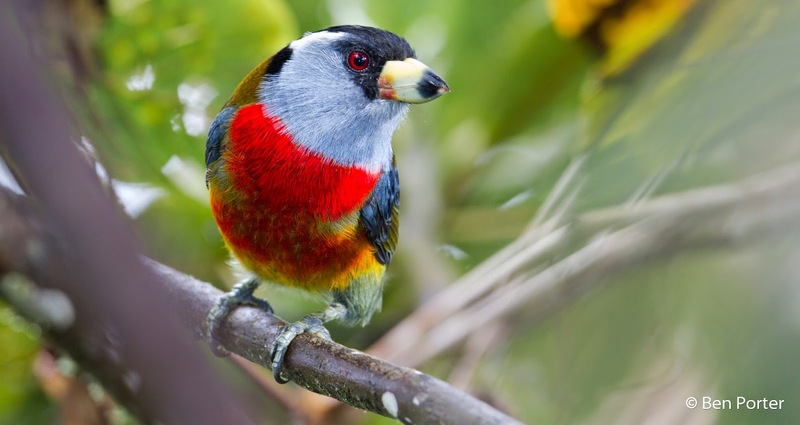 Every now and then we have these stunning Toucan Barbets coming down from the canopy and showing very well around the lodge. 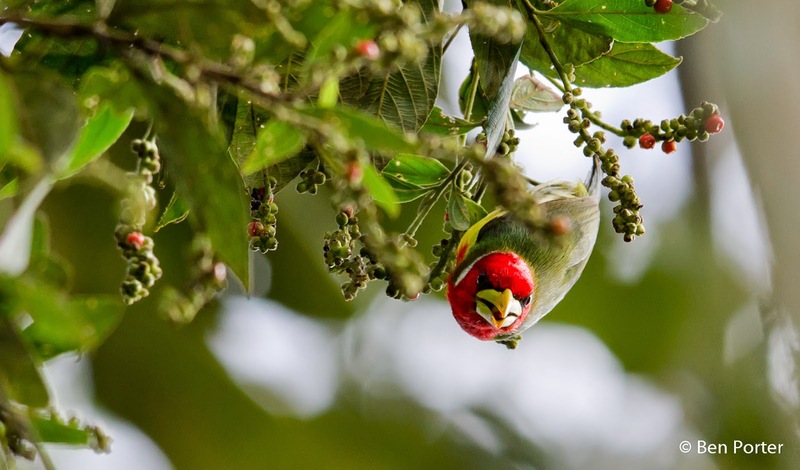 Most of the time these large barbets hang out in the canopy of fruit trees like Cecropias in flocks of up to 10. 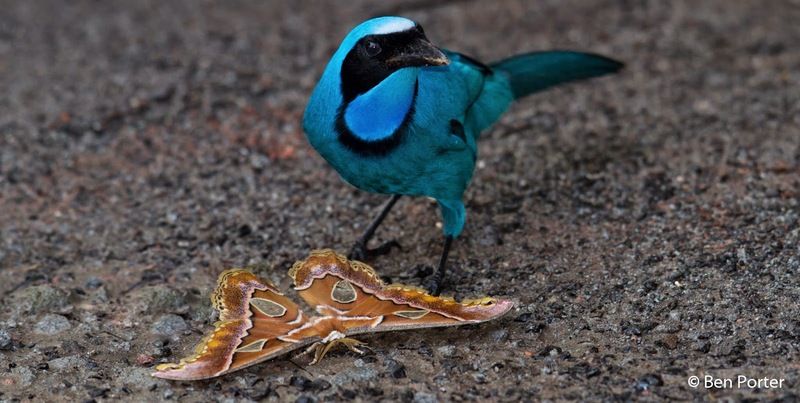 Watching this Turquoise Jay devour this huge Atlas Moth-type was a bit heart braking! 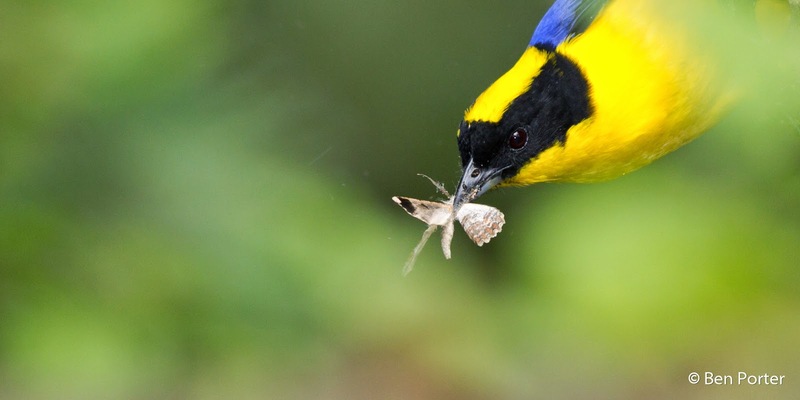 The moth itself is at least half the size of the bird, and yet the jay merely grabbed the abdomen and shook off the enormous wings, and was thus left with a piddly little body to gulp down. 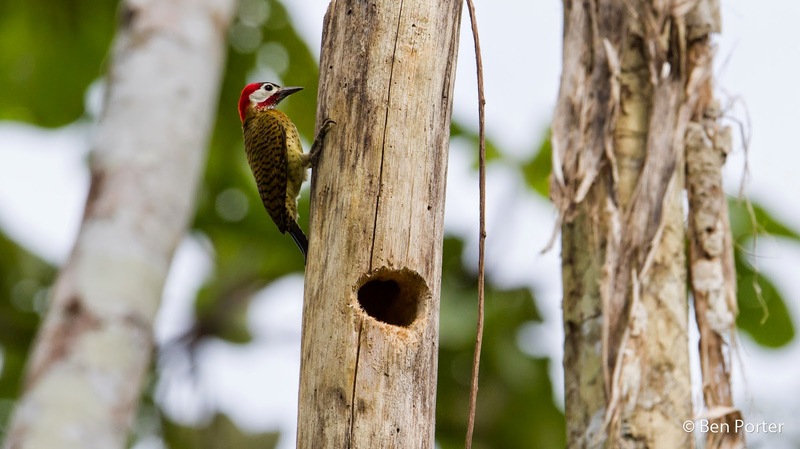 Crimson-mantled Woodpecker. 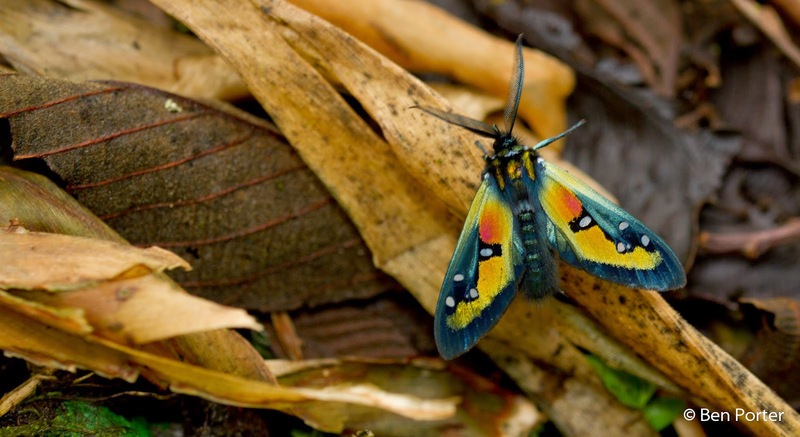 This is one of two species that we have at Bellavista, and is certainly the most colourful.